Plant-Based Protein Mix Blended To Provide A Complete BCAA Profile For Lean Muscle Growth & Recovery! Plant-Based Protein Mix Blended To Provide A Complete BCAA Profile For Lean Muscle Growth & Recovery!Plant-Based Protein Mix Blended To Provide A Complete BCAA Profile For Lean Muscle Growth & Recovery! 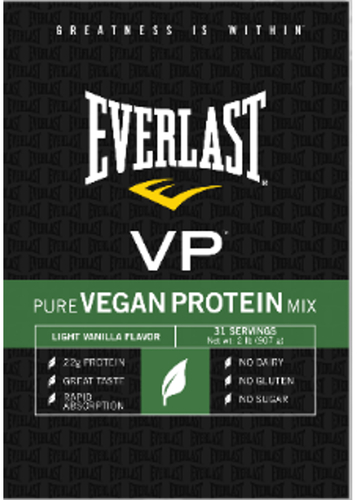 Everlast VP is the ultimate plant-based protein mix delivering a complete BCAA profile using the highest grade blend of yellow pea, rice and hemp proteins to promote lean muscle growth and recovery. Everlast VP is lactose, gluten, sugar, hormone, GMO and cholesterol free. Plus, it has the best taste of any vegan protein mix we’ve tasted. Increases lean muscle mass and strength. Increases lean muscle mass and strength.Increases lean muscle mass and strength. Increases post workout recovery.Increases post workout recovery.